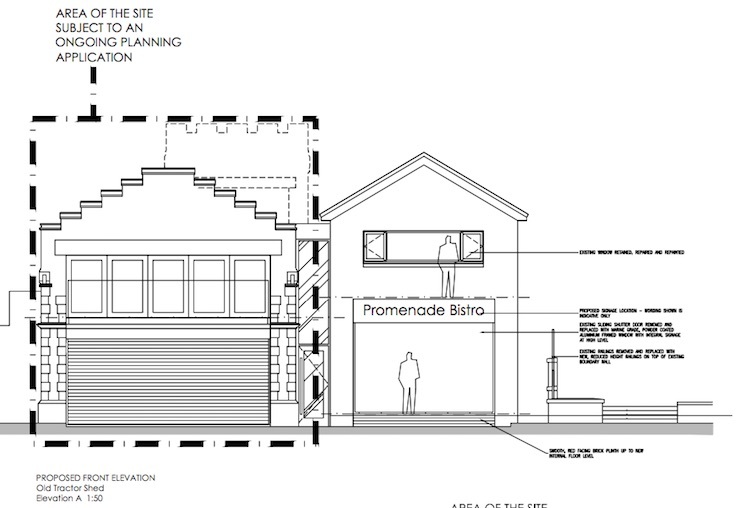 Following on from the redevelopment plans for the old Hoylake lifeboat station, plans have also now been submitted to convert the former tractor shed. “The café will be accommodated within the existing envelope of the building, the only visible changes externally being a new glazed entrance door in the side of the building, enlarged windows to the side to make the most of the views from the seating areas, replacement of the sliding/folding steel door at the front with one large format window and new illuminated signage to the front and side of the building”. There is also an application for illuminated signage on the front and side of the building. It is not clear if the intention is for the premises to be licensed and therefore able to sell alcohol. Again, dedicated parking is not being made available. The triangle of adjacent land is currently owned by Wirral Council and is not part of the proposed schemes. If all the current plans are approved, the old lifeboat station will become a mixed development of a residential property, an outdoor activity centre and a cafe/bistro. This sounds like a great idea, we need something like this on Hoylake promenade . I hope people will encourage this, and not be against it. I think it is worth considering. A cafe in that location well away from other competition could be a success. We are looking at moving back to Hoylake (with small children), a new cafe and outdoor play area would be really appealing as there is nothing on the promenade which is such a shame. There would be no direct competition, making it an ideal opportunity that would be used by both locals and visitors regularly. We walk to the promenade when we visit the beach so parking is not a concern for us. An excellent idea. Somewhere to eat and drink on Hoylake promenade is much needed. Look at the popularity of Tanskey’s on West Kirby promenade. Hopefully in the future there will be a possibility of negotiating to use part of the adjacent Council-owned land (looking untidy and neglected at present) to provide outdoor seating, which would surely be a great asset in fine weather. Just as a PS to my previous comment, my one reservation is about the proposed illuminated external signage. I’m not convinced that such signage is necessary or appropriate in this location. Although in practice this sounds like a good idea unfortunately there will be three businesses in a row along North Parade. The Air BnB with a possibility of max 8 cars plus the owners cars ad motorhome, the sailing club which on good party nights 30+ cars and the café/bistro with a possibility of 38 customers with even more cars. I am a resident of Government Road and have already had problems parking not only in my own street but more than 5 streets around. Another business along a quiet stretch of prom on just such occasion when all 3 businesses are very busy will render residents impossible to park anywhere if they take their car out. I was under the impression that this part of Hoylake was a residential area. or coastal defence function of the promenade, will not be permitted. permitted exceptionally in accordance with Policy NC1. Therefore the current proposal for the Old Lifeboat Station and the adjacent Tractor Shed aligns with this NDP policy reflecting evidence based public opinion. Think it’s a great idea hope it comes off as in the summer would be a great asset to Hoylake as people will come in the summer we have a beautiful beach with lovely views .Hoylak beach was always busy when the baths was here people could get a cup of tea and and buttie and didn’t have to walk too far to use the loo so bring it on .